Spain is lowering the speed limits on its highways by 10 km/h in an attempt to get drivers to consume less fuel. Spain lowered its highway speed limits Friday in an attempt to get drivers to consume less fuel. 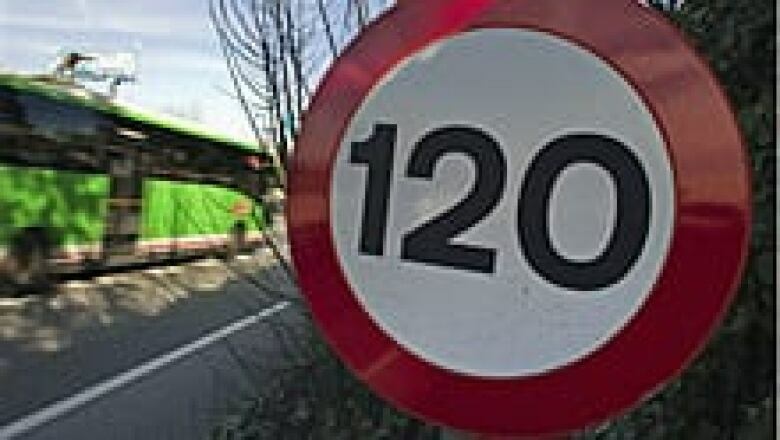 The government announced new rules that will see the top speed on Spanish highways fall to 110 km/h, down from the current 120 km/h. A typical engine consumes roughly 15 per cent less gasoline by slowing that much. The government says every 10-euro increase in a barrel of oil adds 500 million euros in costs to the country's finances per month. The Spanish government made the move in reaction to spiking oil prices and lower supply due to the current unrest in Libya. Libya supplies roughly 13 per cent of Spain's oil needs, and its output has been drastically curtailed this week as widespread protests against the government continue. Deputy Prime Minister Alfredo Perez Rubalcaba said Spain's energy supply is not in danger, despite shutdowns by oil companies operating in Libya, but the national energy bill will rise significantly because of the sharply higher petroleum prices. "We are going to go a bit slower and in exchange for that we are going to consume less gasoline and therefore pay less money," Perez Rubalcaba said. The rules, set to take effect on March 7, will be accompanied by other measures designed to cut the consumption of gasoline. They include a five per cent drop in commuter and middle-distance passenger train fares and a requirement that commercially sold gasoline contain at least seven per cent biofuel, up from the current 5.8-per-cent requirement. "We are going to wage a major campaign to promote public transport, which is always welcome, but which in this case is absolutely necessary for us," he said.